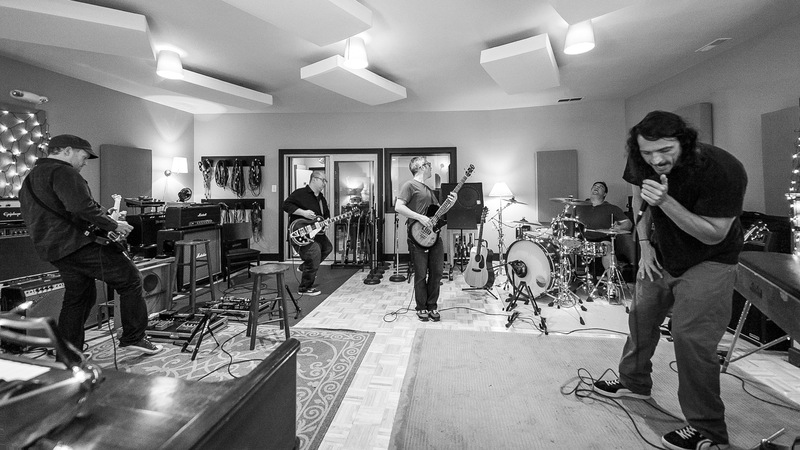 A hard rock band from suburban Philadelphia, Winston’s Dog plays melodic, guitar-driven rock. The band has released their third full-length album, Tactics 1-12, which is a result of several years of development and refinement of the band’s sound into a richly layered style of alternative with impressionistic lyrics delivered through melodic phrases. The album’s title comes from the painting on the album cover by renowned artist Mackie Bowe. The group was founded in the late 1990s by vocalist Jon Robins and guitarists Bill Schwartz and J Murray. In 2002, Winston’s Dog released their self-titled debut album. The sessions for this latest album were the first to feature bassist Pete Mazzaccaro and drummer Paul Ramsey. Tactics 1-12 was self-produced and recorded at their independent studio in North Wales, PA with the help of Echolyn’s songwriter and guitarist Brett Kull. The group employed a democratic songwriting process with ideas fleshed out by everyone. The opening track “Cane” starts with some odd sound effects but soon finds its groove with piercing guitar textures, pointed bass rhythms and rolling drum patterns for a sound with some Pearl Jam influence but enough originality to make it interesting. Unlike most of the other tracks on the album, “Cane” was was recorded in a single night to capture the song’s unhinged energy. “Hand Me Down” follows as a song with a similar quality and vibe, driven by wailing guitar, assertive vocals and slight keyboards by Tim Warneck. “Swim” is a shorter track than the first two and takes a more punk rock approach while still maintaining the established sonic features. “Lester” has a somber, alternative-rock approach with a nice blend of guitars and a thumping bass holding down the bottom end. A later section has an intense, droning beat to build the intensity before nicely returning to the original groove. Through the middle tracks of the album, it does lose some momentum due to repetition of style but the songs are still quality and entertaining. “Car Crash” has a kind of a folksy feel with some slight harmonies, while “Tripper” features choppy, beat-driven riffs which give the lead vocals some space to find their dynamics. “Hairless” is shorter and slightly less interesting, while “Fence” features dramatic garage band riffs and assertive drumming throughout. While the band continues to promote this album with live performances, Winston’s Dog does plan to do more recording in the near future, They’re hoping to go a little bit different route this time and would like to put out a shorter EP before the end of this year.